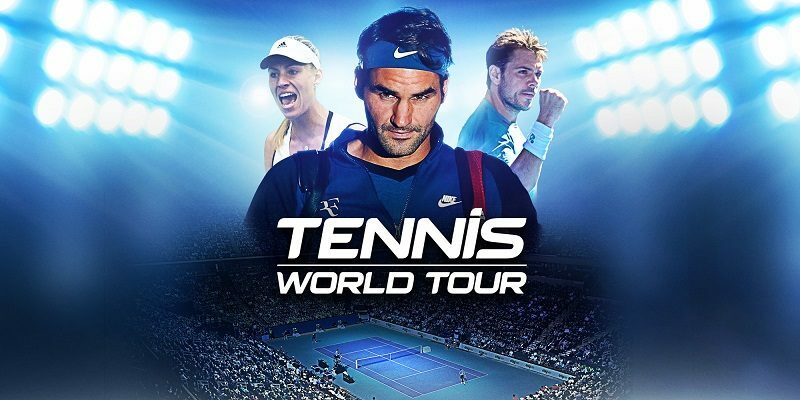 On this page, you will find all there is to know about the Software updates for Tennis World Tour on Nintendo Switch (originally released on August 30th 2018 in Japan, and October 29th 2018 in Europe and North America). How to download updates for Tennis World Tour for the Nintendo Switch? Slide animations have been added on clay courts. A new style of forehand has been added to the character creator: the “whip” forehand, with a whole new set of animations. New serve preparations and serve styles have been added to the character creator. The Season mode can now be accessed when a cup is being played. You can go play ranked matches in-between your Cup matches. Added an introduction to the Training stadium. Updated the order in which players are displayed in the Character selection screen, to better reflect current ATP rankings. Updated Agassi and McEnroe’s skills set. Sped up the rally and serve pace (about +5%). Improved the global accuracy on difficult ball, because Attackers were causing too many unforced errors on difficult shots or difficult positions. Lowered the height threshold for the “low-arc” malus on shots, from 60cm down to 40cm. Increased the regeneration of stamina between points and sets. Fixed a bug that could make players teleport during shot preparation. Fixed a bug that was causing the players to hit the ball without making any contact with it. Improvements to the shot selection engine to remove most of the instances of unwanted slice effects. In practice, this should improve the chance of getting the effect asked for during the preparation of the shot. Fixed a bug that was penalizing serve returns on the forehand side, resulting in an unnaturally higher number of Aces. Fixed a bug regarding the orientation of the players after a shot. They are now correctly facing the court after each shot, making the whole rally look more smooth. Fixed a bug with AI movement. The AI will now accurately run towards the ball, notably on dropshots. Fixed a bug in the AI that was preventing them from using lobs. Improved the choreography when interrupting the serve preparation animation. Fixed the missing racket shadow at Quito’s venue. Fixed an unwanted halo effect around players during cutscenes. Fixed new equipment pictures that were displayed upside down in the reward screen. Fixed some Octogon and Tooltech dampener textures. Fixed a bug where Season Cups were sometimes played at the wrong venue. Fixed a bug where player outfits were not saved correctly during Season Cups. Fixed a bug that could sometimes prevent the Surgery event from appearing in the Career mode in December. Fixed some minor interface issues. Please note: in the previous patch notes, we listed that new rackets were available for custom characters. This change was not correctly applied last patch, and the missing items have been reintroduced this patch. AI will stick to its baseline more if it’s not a serve & volleyer. Tweaking AI faults depending on AI difficulty. Fixing a crash in some camera traveling. Fixing Sophie Walker’s XP bonus in displayed XP points. Fixing Maxime Teixeira’s unlock as a playable character when Academy School is 100% complete. Fixing the « Round » displayed in « My performance » in the Tournament result screen when forfeiting before a match. It was off by one round in this case. Fixed a crash in some camera traveling. Fixed Sophie Walker’s XP bonus in displayed XP points. Fixed an issue with unlocking Maxime Teixeira as a playable character after 100% completing Academy School. Fixed the «Round» displayed in the «My performance» section of the Tournament result screen when forfeiting before a match. There is now a help for serve, activated at default. This will help you understand when to release pressure on your controller to perform the best serve. Increased XP gains for winning tournaments in Career mode. Improved and diversified AI ‘move to net’ strategies. Improved the crowd’s animation cycles. Serve preparation can now be interrupted after 2sec. Tournament mode has been added. Joy Con solo mode has been added. Fixed the description of unlock requirements for skills linked to a particular events. Fixed the missing display of dropshot and sprint buttons in the Tennis School lessons. Fixed a bug that would affect lobs by applying the same charge as the previous shot. Fixed Dubai’s court limits which were slightly off, causing balls to be called out when they were touching the lines. Changed a text in the Volley Training to better describe how to use the “Volley preference” button. Fixed a graphical glitch in the Skill menu on locked skill slots. Stamina gauges are not correctly being hidden during end match cinematics. Fixed the displayed match duration when forfeiting a tournament match and when pausing the game. Fixing First serve and Unforced errors stats displayed.